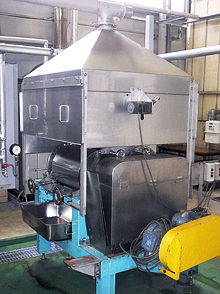 Drum dryers are of conductive heat-transfer type. 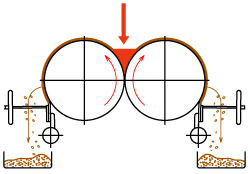 A heating medium (generally steam) is sent into the rotating drum (cylinder) and liquid material is fed on the heated drum to evaporate and concentrate, and concurrently the liquid material is stuck on the drum surface in the form of a film, then promptly evaporated and dried. Dried materials are scraped continuously with a stationary knife. 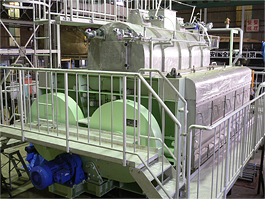 Drum dryers are roughly classified into an atmospheric type and vacuum type according to operating pressures, and also, they are classified into a double drum type, twin drum type, and single drum type according to the number of drums. Further, the single drum type is classified into a dip type, spray type, splash type, top roll type (single-stage, multi-stage), side roll type, below roll type, etc. 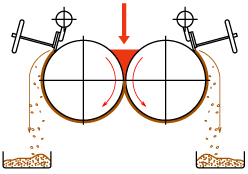 according to the liquid feeding methods. These classifications are based on the trial for making materials adhere to the drum surface more uniformly and efficiently. Scraper knife no pressing type and drum material of carbon steel with clad steel are available in accordance with its application. Operation is continuous, allowing products of stable quality. Drying time is short and materials are not exposed to high temperatures for a long period, making materials which are sensitive to heat possible to dry well. 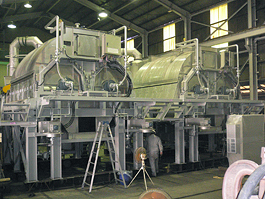 Drum dryers are devices which are rational in most to perform evaporation and drying at the same time. Because the drum dryer is a heat-transfer drying system, its thermal efficiency is better than that of the other type of dryers and it is very economical. Because no liquid is left inside at shutdown, processing is possible to the last one drop. Performance adjustment is easy to carry out extensively, allowing one person to manage several units. Cleaning in the dryer is simple, making a change of application easy. Before using the drum dryer, it is absolutely necessary to confirm the property of materials to be treated using a test machine. Double, Twin, and Single Types, any of which is available to test.